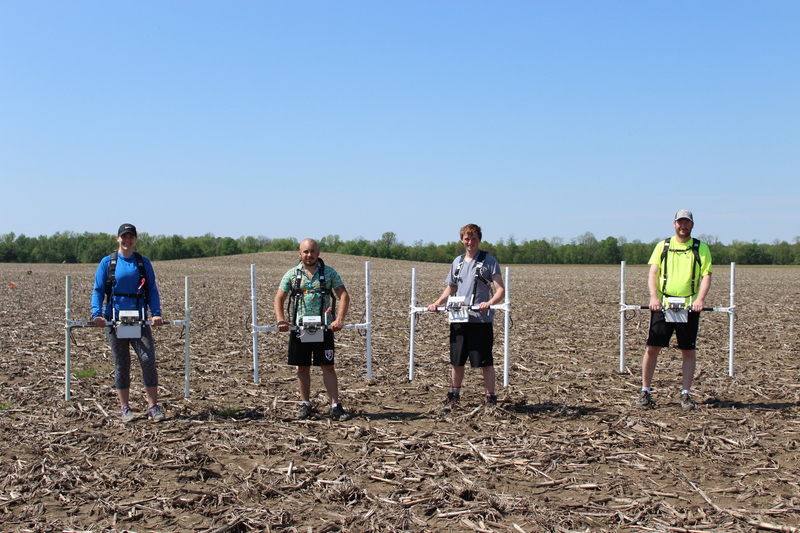 Personnel from the Illinois State Archaeological Survey (Robert McCullough, Cale Scott, Marie Meizis) joined Michael Strezewski of the University of Southern Indiana, graduate students from the Glenn Black Laboratory of Archaeology at Indiana University and Indiana-Purdue University at Indianapolis (IUPUI), and other professional archaeologists for a volunteer weekend to collect magnetometry data at the Mann Site. The Mann site, located on the Ohio River near Evansville, Indiana, is a sprawling Middle Woodland complex with earthworks and mounds dating to between A.D. 100 and 500. The state of Indiana has been gradually acquiring portions of the site to ensure its protection, and the volunteer weekend May 5th and 6th was to help evaluate recent acquisitions. Four Bartington gradiometers, one from each institution, it was possible to collect data on subsurface features across 47,600 m2, or nearly 12 acres, greatly enhancing site management planning for this important site.